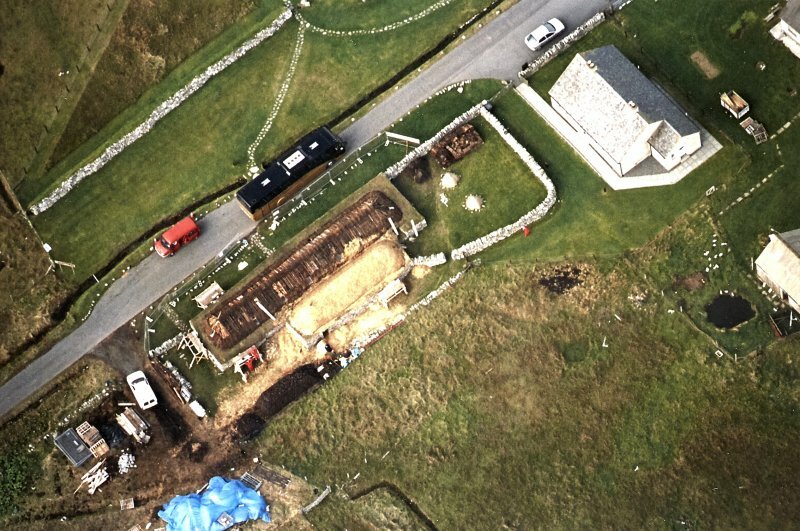 Oblique aerial view centred on the re-roofing of the museum, taken from the ESE. Arnol No 42 - Arnol Blackhouse, c.1885 Traditional Lewis dwelling with drystone walled stackyard, preserved as a model of the hundreds whose roofless cells now honeycomb the stony landscape. 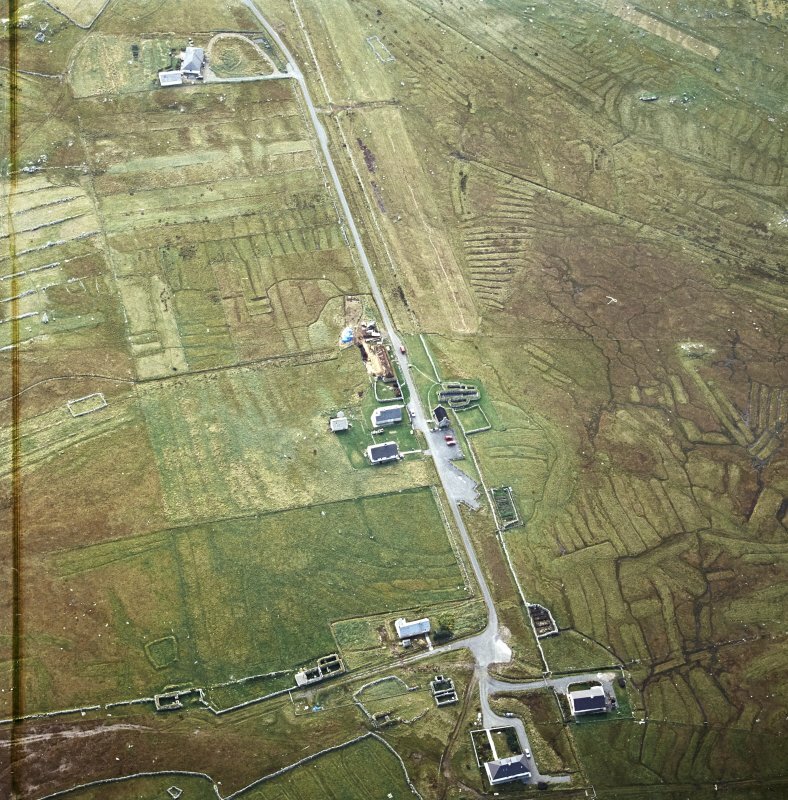 Last occupied in 1964, it was one of the last of its type to be built and, unlike many, was not modernised, so that it retains the traditional appearance of a longhouse with no windows or chimneys. The sloping timber roof structure, straw thatch roped down and anchored with stones like a trussed-up package, rests on the inner edge of a grassy parapet. This wallhead is capped with blue clay, through which rain percolates to an insulating earthern core, keeping it damp and thus windproof between the two drystone skins that make up the great thickness of the walls. 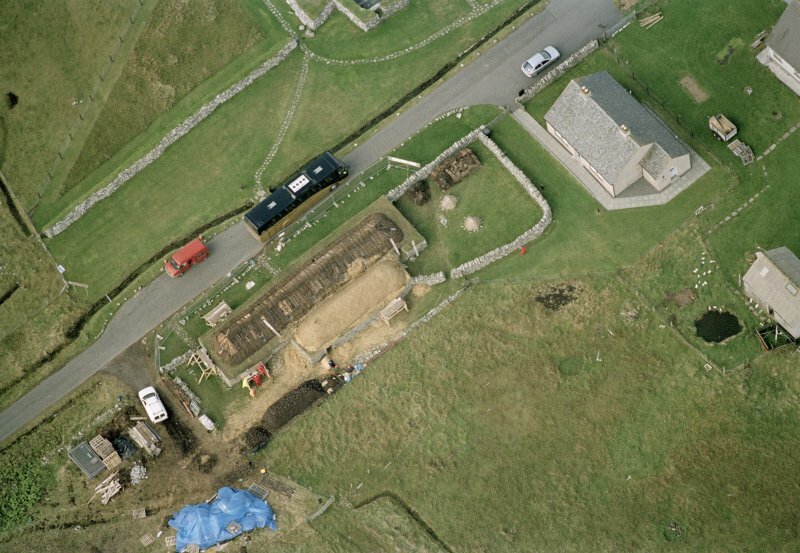 The main range, with one entrance shared by humans and livestock, comprises an ill-lit two-roomed dwelling, partitioned to wall height, and a byre at the lower end with an open central drain running out to a midden. The byre's roof pitch is altered to control smoke penetration and the flow of air/heat to and from the 'uphill' living area. An interconnecting parallel barn range adjoins to the rear, its flailthrashing floor with the through doors alignedto create a draft to aid winnowing. Although primitive, these houses were finely tuned to their environment. Their carefully balanced ecosystem began to fail only as a result of 'improving' alterations, often compulsorily imposed by landlords. 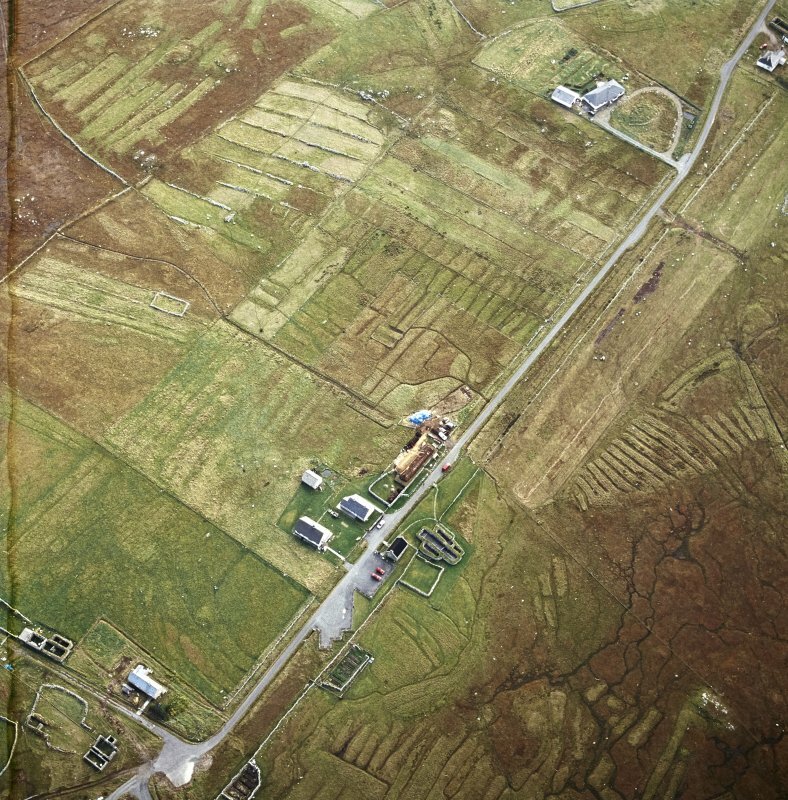 Historic Scotland property open to public; guide book available. 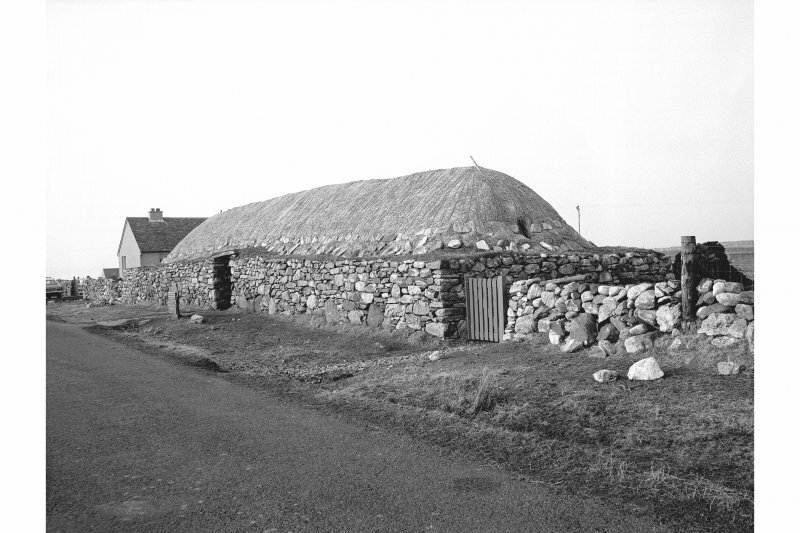 Few blackhouses in the islands are still inhabited, and not many are maintained: straw thatch needs regular attention and renewal, although heather thatch can last for decades. When a house is not properly heated and the roof is allowed to fall in, it can deteriorate rapidly, but fortunately at least one of these old houses, with its outbuildings, is now preserved. 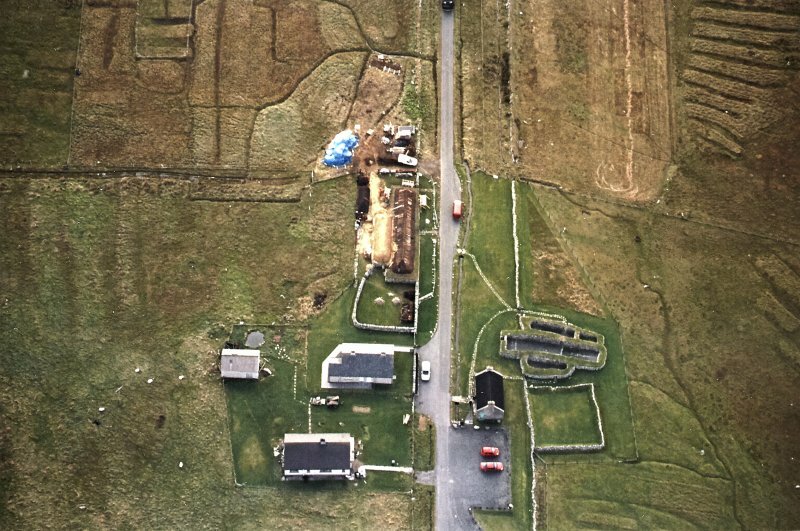 The visitor can see clearly how buildings and areas with a variety of functions (dwelling, byre, barn and peat store) are all under adjoining roofs, a sensible arrangement in an adverse climate. The small number of windows and doors keeps draughts to a minimum; the thick double walls with earth and midden between them keep out not only the weather but even the sound of the storms. This house was built in the late 19th century and does not have some of the features seen in earlier houses, such as the rounded outer corners, which were designed to reduce wind resistance. 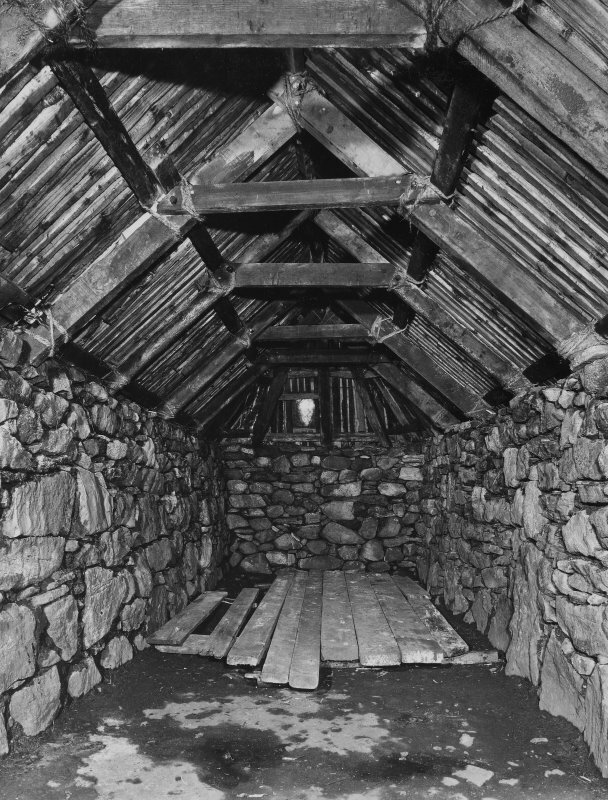 Rain runs down the roof and into the thickness of the walls, keeping the soil between the inner and outer skins damp and thus both helping to hold it together and keeping the wind out; the stones of the inner face are laid with a slope on the upper surface, to discourage the damp from entering the house. The roof is thatched, straw over sods on a timber frame, the rafters placed on the inner face of the wall. 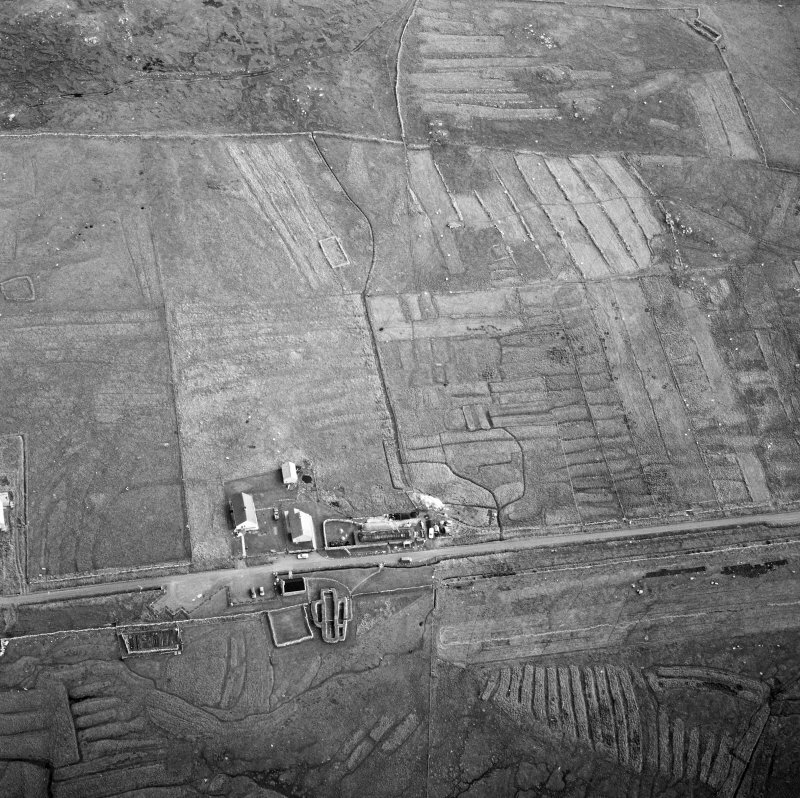 At one time the soot impregnated straw was removed annually and used for dressing the arable land. The flat area around the edge of the roof, on top of the wall, facilitates thatching and repairs; steps built into the outside wall allow easy access. 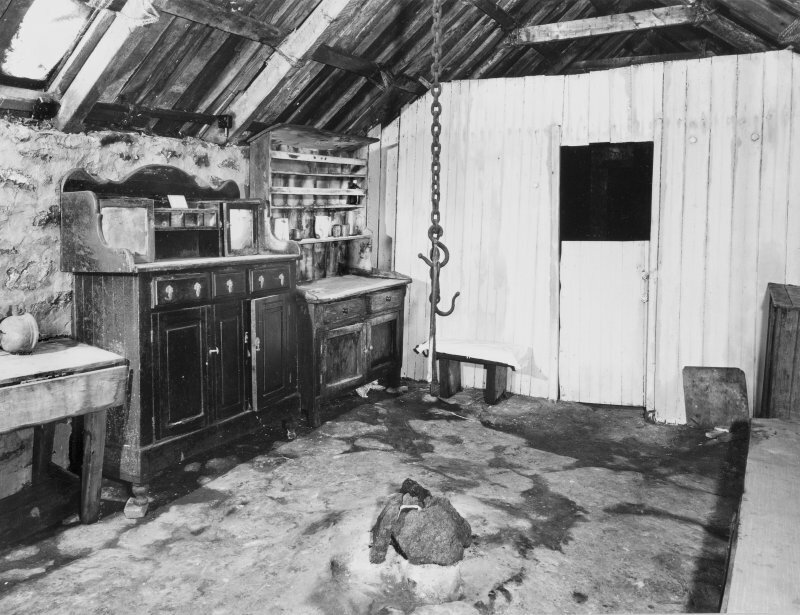 Cattle and people shared the same entrance, separating inside-cattle to a byre on the right, with wooden stalls and a box-pen for calves. A central drain runs out through the end wall. People turned to the left, into a living room, with a fire in the centre of the flagged floor, a settle on one side, on the other a dresser and cupboards. Stools provided extra seating. Cooking was done on a girdle beside the hearth or in pots hanging from a chain fastened to the rafters; hooks allowed the pots to hang at varying distances from the fire for boiling or simmering. There is no chimney or hole for the smoke. 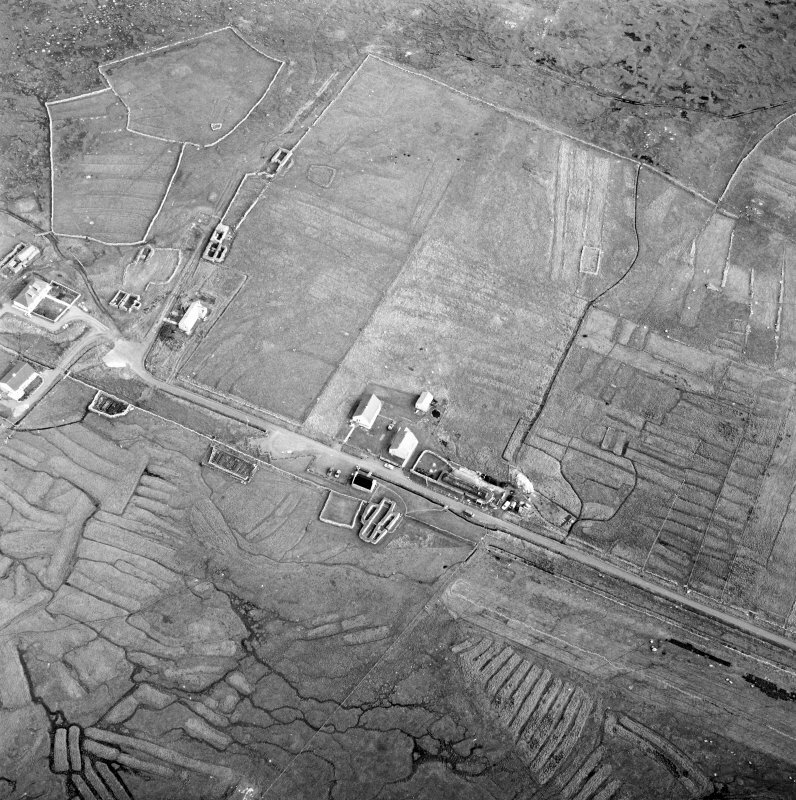 Beyond the living area are the box beds; the thatch was rarely totally efficient, and box beds kept out any draughts or rain that might penetrate. Before restoration most of the walls and parts of the ceiling in these two areas were papered. A door opposite the main entrance gives access to the adjoining building which was used as a barn. In the back wall is a low aperture, blocked now, in line with the passage between house and byre; this provided a draught for winnowing on the floor of the bam. This central area was used for a variety of purposes-storing fleeces or potatoes, and keeping foodstuffs for stock. 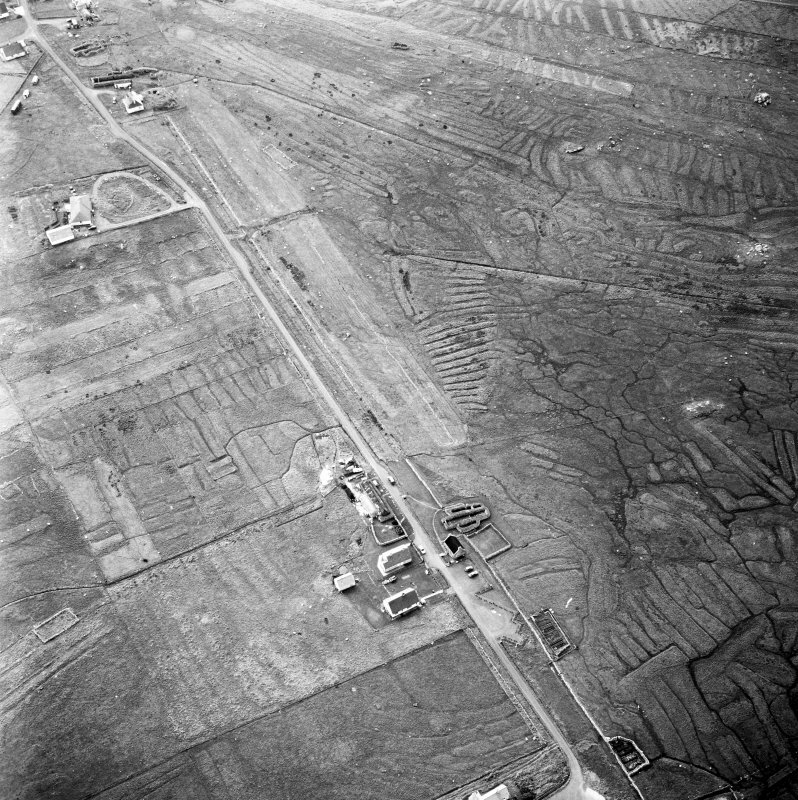 Some agricultural tools were also kept here. 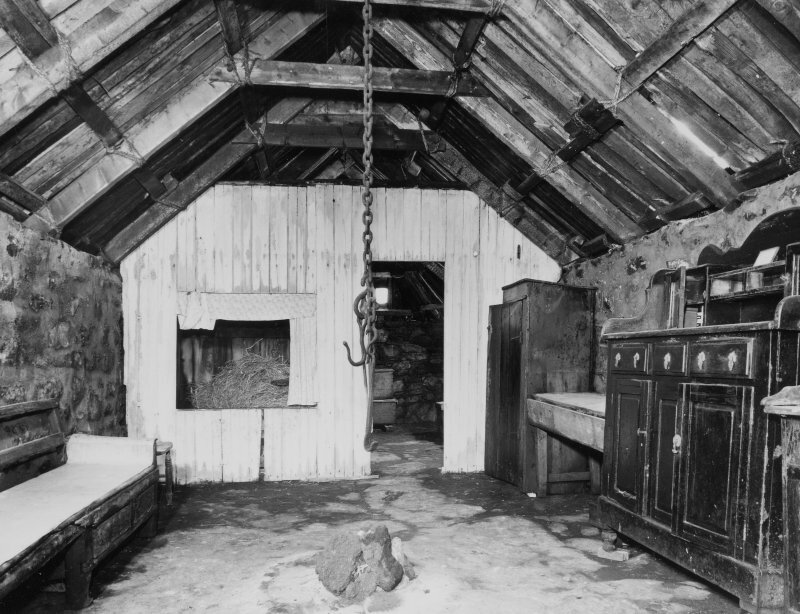 To the left is a wooden floored area where the sheaves were piled, tossed through a hole opened in the roof. At the other end is a partitioned area, used as a store for dry peats, and as a shelter at lambing time. Outside the house is a walled stackyard. Water was taken from springs, which generally have a built stone cover. 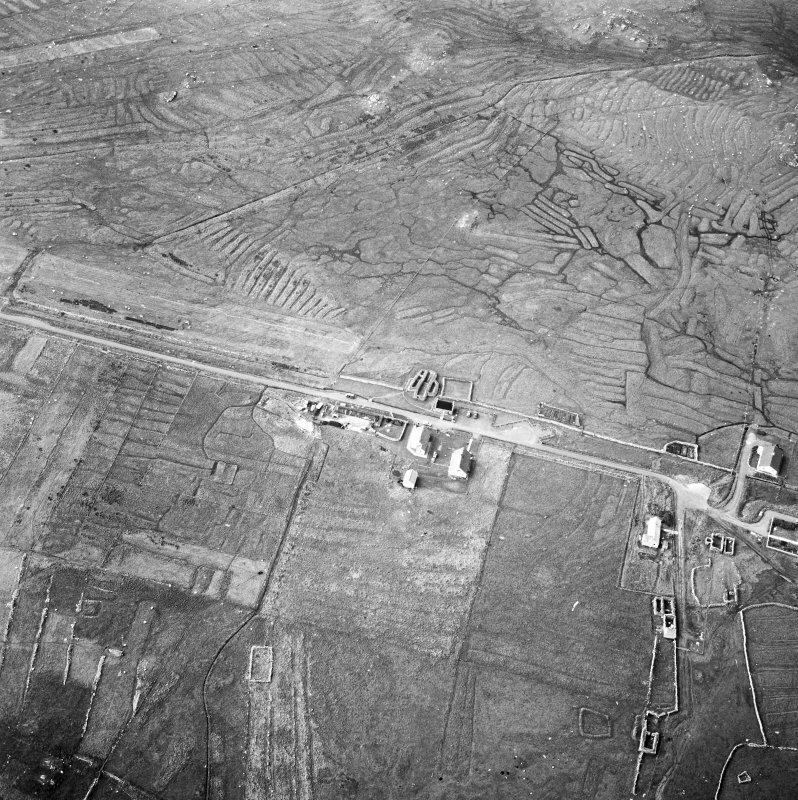 These springs or wells could be some distance from the houses which relied on them. Lighting was provided, before the advent of electricity, by paraffin lamps. 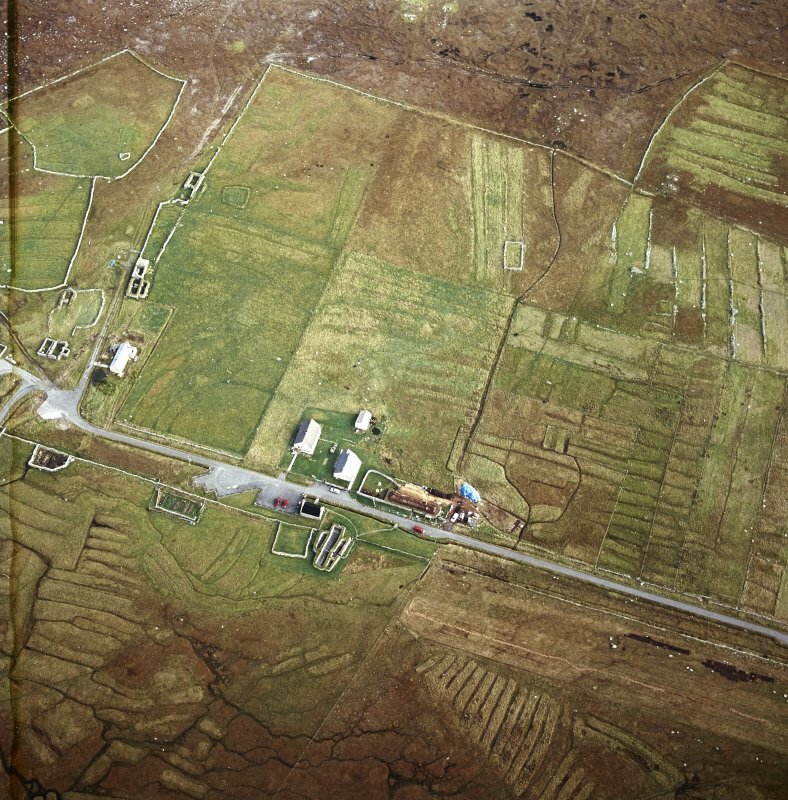 There are a number of houses in Arnol which show the main structural features seen in the museum, and in many other townships blackhouses or remains of blackhouses may be seen: there are, for instance, two at Callanish (NB 213335 and NB 213331); the plan ofa roofless example can be seen fairly well from Dun Carloway Broch (no. 61) and at Garenin (NB 192442) there is an unusual group, now very dilapidated. Here several houses have been built close together on either side of a track; some have undergone later alterations, including the construction of stone gables. NB 31069 49238 This property is owned and managed by Historic Environment Scotland and comprises a thatched blackhouse, byre and adjoining barn, open to the public as an exhibition of a once common building type and way of life. 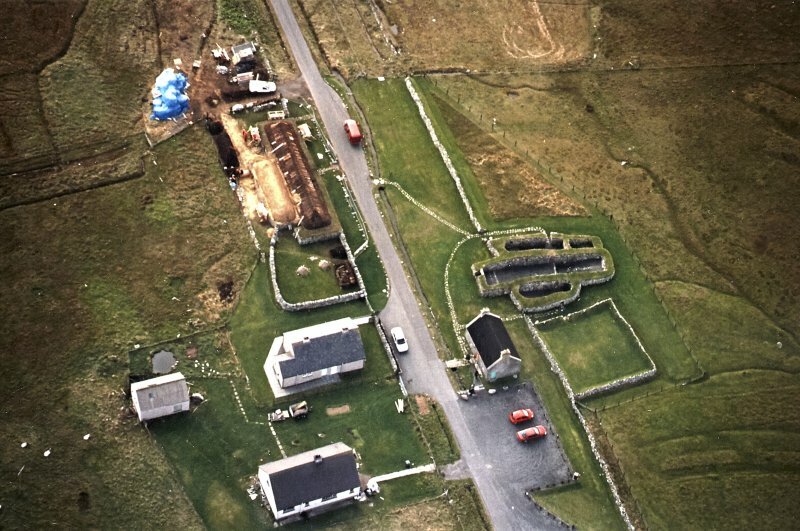 The blackhouse was built circa 1880 and was last occupied in 1964. 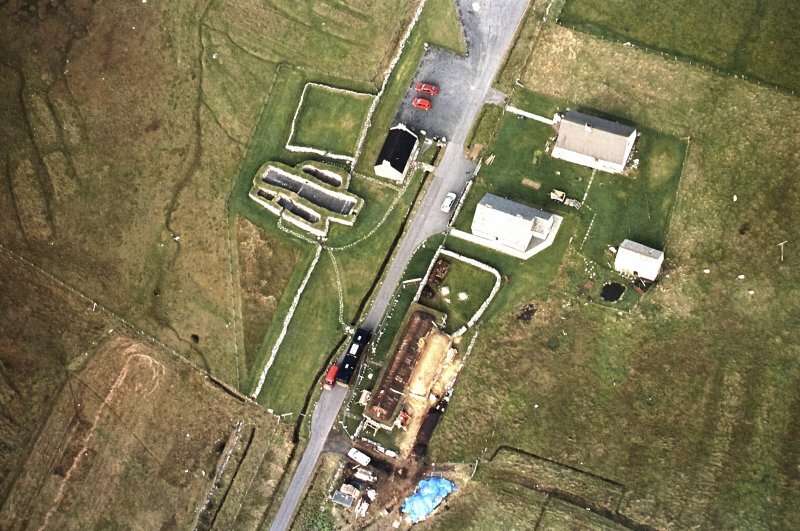 The main blackhouse range incorporates a byre at one end, and has an adjoining parallel barn range at the rear. Both roofs are thatched in straw, with a continuous straw ridge. The thatch has been entirely netted, including across the ridge, which has been weighted down with stones and ropes that run vertically down the roof and across the ridge. At either end the ropes are secured to timber ‘horns’ that protrude through the thatch. The netting is also weighted along the wallhead with stones that are placed on the edge of the net as well as by the turf laid on the wallhead. There are two small straw thatched outbuildings to the north, which have been netted and weighted with stones.